38 // MARCH 2018 USAHOCKEYMAGAZINE.COM Academic Hockey– College Exposure Showcase College coaches evaluate and coach: Three games, two practices, two recruiting seminars. Junior coaches and ccouts will also be on hand to evaluate. 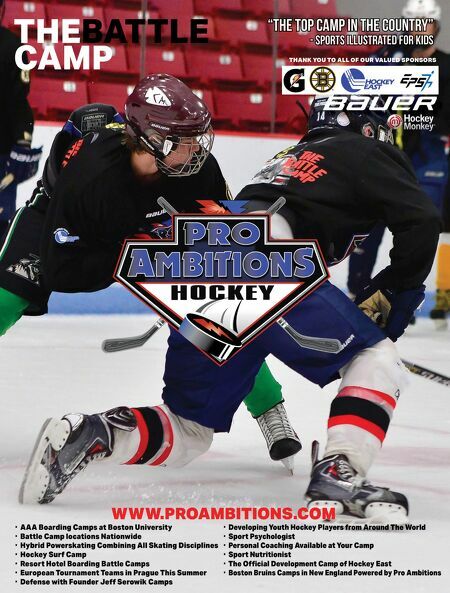 Boys, ages 15-19, July 8-10, in Exeter, N.H. » (603) 252-2267 » academichockey.com Academy of Hockey at HARBORCENTER The Academy of Hockey is the premier development destination. Register for summer, in-season or spring season programming, focused on developing core hockey skills and building a player's hockey IQ. » (716) 855-4297 » harborcenter.com/academy All-World Hockey Institute Challenging programs with pro- fessional instruction for all levels of players from AAA to novice. Our programs emphasize skill devel- opment, proper techniques, game knowledge and sportsmanship. » (714) 518-3211 » the-rinks.com Army Hockey Camp Overnight or day camp on the cam- pus of the United States Military Academy at West Point, N.Y. Two daily ice sessions of instruction and scrimmages. Use of campus facili- ties for off-ice activities. » (845) 938-8012 » armywestpointsportscamps.com Bertagna Goaltending Schools (45th year) Four sessions (four-day, five-day and once-a-week options) in the Boston area, directed by former Bruins/Olympic goaltending coach Joe Bertagna. Two hours daily. Day camp. » bertagnagoaltending.com Breezy Point Hockey Camps Welcome to Breezy Point Hockey Camps, where we pride ourselves on having the most complete hockey training and camp experience in the country. Located in beautiful Breezy Point, Minn., our camps provide players with elite training, both on and off the ice, as well as a fun camp experience. » (218) 562-5678 » breezypointsports.com Bridgton Sports Camp In a jam-packed three-week ses- sion, campers will major in hockey at our state-of-the-art facility, while experiencing everything a tra- ditional camp has to offer. » (866) 283-5943 » bridgtonsportscamp.com Canadian Hockey Enterprises (CHE Hockey) CHE Hockey offers world-class hockey camps for boys, girls, men and women of all ages and skills. Instruction from professional play- ers, coaches and female Olympic/ National team players. » (888) WON-1980 » chehockey.com CAN/AM Hockey Camps Lake Placid, N.Y.: Weeklong camps (July 1-7, July 8-14, July 15-21, July 29-Aug. 4). Niagara, Ontario: Weeklong camps (July 15-21, July 22-28, July 29-Aug. 4). One-on-one training — it's the signature of every CAN/AM program. CAN/AM Adult Hockey Camps Lake Placid, N.Y.: Weekend camps (June 14-17 & Oct. 4-7). Niagara, Ontario: Weeklong camp (July 22-28). Las Vegas: Weekend camp (Aug. 9-12). If you're serious about improving your game CAN/AM is the place for you, no matter what your skill level. CAN/AM Family Camps & Clinics Lake Placid, NY: Family weekend clinic (June 15-17 & July 13-15). Lake Placid, N.Y.: Family weeklong camp (July 23-27). Niagara, Ontario: Family weeklong camp (July 30- Aug. 3). Make this the year you travel to camp together. This family camp experience will be one that you will all cherish for a lifetime. » (800) 678-0908 » canamhockey.com » score@canamhockey.com » @canamhockey CAS Hockey Academy At CAS Hockey Academy, you can maximize your hockey game while having fun and meeting new friends at one of the best hockey camps in New England. Our ice hockey camp is offered July 8-Aug. 4 and camp- ers have option of attending 1,2, 3 or 4 weeks. Improve your game this summer. » (800) 645-3226 » campallstar.com/hockey Compete Hockey School A variety of premier position spe- cific and game situational hockey camps run by former NHL player and professional skills coach Cam Severson in conjunction with the Coeur d'Alene Hockey Academy that specialize in maximizing overall skill development through professional, experienced coaching and a unique cutting edge on-ice curriculum. » (208) 665-1331 » cdahockeyacademy.com HMI–Christian Hockey Camps This is the 42nd year of providing quality hockey instruction com- bined with training in Christian living. International hockey training program features drills from seven countries. Instructors include current and former NHL players. Camps offered in 35 locations. » (514) 395-1717 » hockeyministries.org Czech International Hockey Camp The Czech International Hockey Camp prides itself in 20 years of Czech hockey coaching excellence. Join players from more than 30 different countries from all over the globe for the hockey holiday of a lifetime. Professional and experi- enced Czech coaches will teach you what you need to take your skills to the next level. » 00-420-776-662-649 » hockeycamp.cz 2018 CAMP LISTINGS Summer is just around the corner. As this hockey season comes to a close, it's time to think ahead to the 2018-19 season. 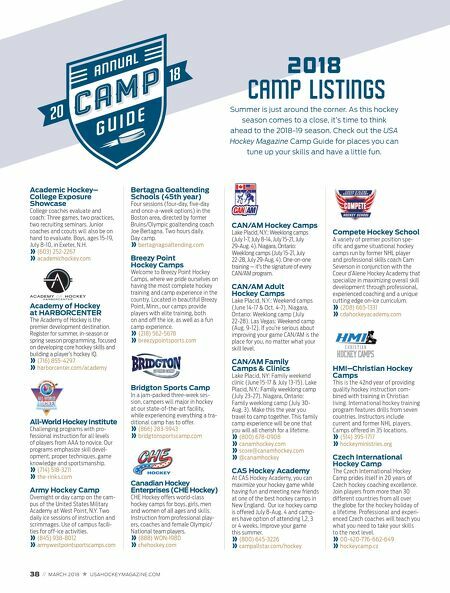 Check out the USA Hockey Magazine Camp Guide for places you can tune up your skills and have a little fun.